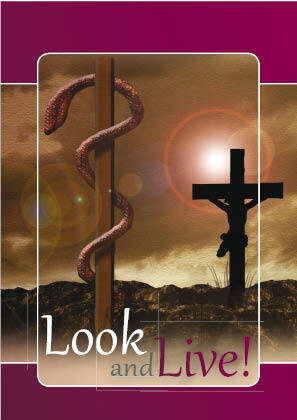 Octagon Notes: Lent 4: "Look at the Cross and Live"
I have known this text from my childhood. I am confident that I was made to remember it in Sunday School. It is a famous text: it has been described as the gospel in miniature. For any would-be evangelist (which is all of us) it was one of those verses that had to be kept loaded and ready to fire! But John does something quite different with this text: he precedes it with a reference to the incident in Numbers when the Israelites are punished for their rebelliousness by an infestation of poisonous snakes and Moses, to save them, designs a cross with a brazen serpent on it and whenever someone is bitten then the afflicted person must look at the image and they will recover. John connects this detail with the cross; i.e. Moses’ design of the uplifted serpent prefigures Christ’s saving work on the cross. In the Moses’ account, if someone is bitten they turn, look at the snake on the cross, and live. There is a crazy and bizarre aspect to the story of the snakes in the desert, but John doesn’t hesitate to use it and make the connection: This is what God did in the desert then and this is what God has done on the cross now. Look at the cross and live! How does this work for us? The truth of life in this world is that it can be harsh. We almost certainly will be bitten by something, though probably not a snake. Troubles in relationships, in work, in our family, in our church, in our community, there is so much scope for something to go wrong. But being ‘bitten’ is usually nothing that we can prevent; the only thing we can control is how we respond to it. In the Moses story they are saved by looking up at the brazen serpent. In the Christian story the same principle applies: we look up at the cross – and we live. We look up at the cross – and that makes us stop looking down at whatever it is that we are struggling with. We no longer give our attention to what torments us; in fact giving it our attention is frequently likely to empower it. Instead we must look at the cross – and live! To look at the Cross is to pray. We keep coming back to the Cross to this great sign which is the medicine of the world - "Crux est Mundi Medicina" (The Cross is the Medicine of the World). Look at the Cross and live!